Many new laptops will demonstrate the power-saving elements of Intel's new fourth-generation Core parts, but not the new, $1,579 CyberPower FangBook Evo HX7-200. This sharp-toothed monster is designed for performance, shredding older competitors with Intel's latest mobile CPU and Nvidia's newest mobile GPU. Yes, Intel's taken the wraps off the CPUs code-named Haswell, addressing everything from desktops to gaming notebooks, business notebooks, and ultrabooks, and even down into tablets. Inside the new HX7-200 lies the Intel Core i7-4700MQ, a quad-core chip with hyperthreading support that runs at a base clock speed of 2.4 GHz. Intel's M-series mobile processors are a step down from the top-of-the-line H-series, where you get Intel’s new Iris Pro graphics. But if you're a dyed-in-the-wool gamer, you want a discrete GPU anyway. CyberPower obliges by putting an Nvidia GeForce GTX 780M to help drive this beast's 17.3-inch, 1920-by-1080-pixel display. This isn't the thinnest notebook we've seen, but it is the fastest. Our Worldbench 8.1 benchmark suite is still relatively new, so we haven't amassed a large collection of scores that we can compare to the FangBook EVO, but a Notebook Worldbench 8.1 score of 417 indicates the Fangbook is clearly in a different league. The next best score of 284 belongs to the Toshiba Kirabook, which is powered by a third-gen Core i7-3537U and 8GB of memory. Although PCWorld’s Worldbench suite includes games such as Crysis 3 and DiRT Showdown, I also tried two slightly older action games— Saints Row: The Third and Metro 2033—to get a more subjective opinion. Both played superbly at high resolutions and detail: 1600 by 900 for Saints Row, using “high” settings, and 1650 by 1,050 while using DirectX 11 “high” settings for Metro 2033. I noticed no slowdown with either game, although there was some slight tearing in spots while playing Saints Row. Fan noise increased as the notebook took on the heavier processing load, but it never reached bothersome levels. On a more objective note, the PCWorld Lab recorded the FangBook Evo running Crysis 3 at Ultra quality and resolution of 1920 by at an impressive 20.8 frames per second. Running Windows 8 from the 60GB SSD also contributed to this machine's high Worldbench performance. But you needn't worry about running out of storage, because there's a 1TB mechnical hard drive inside, too. The CyberPower FangBook is an attractive gaming notebook. It’s worth noting that the fourth-generation Core chips include Intel's new integrated graphics processor, the Intel HD Graphics 4600. This is a step up from the third-generation parts, both in terms of horsepower and efficiency. Intel claims that chip is so efficient that it consumes just 1.9 watts of power while playing HD video. That's significant for notebooks that run on battery power much of the time, but gamers who buy the FangBook will probably keep it plugged in most of the time anyway. We can't report on battery life at this time, because we received the unit just a few days ahead of Intel's info dump. We'll update this review when we have that information. Physically, the Fangbook EVO is on par with the Alienware M17x: it's not quite the biggest horse in the stable, but it's physically imposing nevertheless. It measures 16.85 inches wide by 11.34 inches deep and 2.17 inches thick. It weighs in at 10.75 pounds with power brick and accessories. That's heavy enough that you’ll want to ensure you have a backpack large enough to truck it to LAN parties. The Fangbook’s keyboard layout is conventional enough, but at the top of the screen sit eight “quick start” buttons. Several only work after the user installs a special SCM application that comes bundled inside the box. Once installed, users can toggle overclocking, a fan boost which cools the notebook, airplane mode, and more. On the left-hand side of the notebook sit two USB 3.0 ports and a USB 2.0 port, plus microphone, headphone, and audio I/O jacks.Two more USB 2.0 jacks hide on the right, plus a DVD+/-RW drive; sorry, Blu-ray only ships as an option. HDMI, DisplayPort, and an Ethernet jack are mounted on the rear. 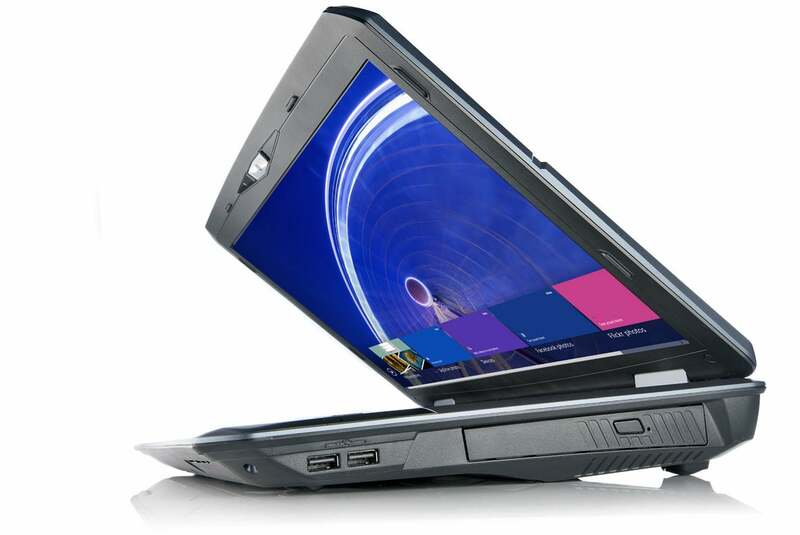 The notebook includes THX TruStudio Pro for audio enhancement, although the included speakers sounded rather flat when playing a mix of classical, blues, and rock. Note that you can also connect dedicated external speakers for extra oomph, though. CyberPower’s build quality is good, although I noticed some flex in the panel. While the keyboard is actually relatively comfortable to type upon, it feels a bit cramped—somewhat surprising, given that there’s more than an inch of extra space at each side. A reddish keyboard backlight is available, but must be toggled on and off using the hard buttons directly underneath the monitor. The FangBook EVO also includes a normal-sized number pad to the right. Granted, this is a gaming notebook, which means that a subpar keyboard may not be as important as, say, the graphics chip. Given the fact that Windows 8 is installed, one can’t help but paw at the screen when it’s time to navigate within apps. That won’t work, however, as the Fangbook does not include a touchscreen. In fact, the touchpad doesn’t appear to support gestures at all, and the touchpad itself isn’t clickable. All in all, the navigation is an experience you might expect to find in a notebook from a few years ago. On the other hand, any gamer worth his salt will use a mouse and keyboard, and the expansive palm rest works fine for both WASD and numberpad control schemes. One more note: The Windows key is also in an awkward location to the right of the space bar, perhaps to avoid being accidentally struck by WASD gamers. The FangBook Evo HX7-200 is one of the first Haswell notebooks out of the gate, so it's too early to know if CyberPower’s offering will be the best of the bunch. If you're wondering whether Intel's fourth-generation Core processors are worth the investment, the answer is an emphatic yes. Knowing whether this particular machine is worth $1,600 is a much tougher question, but it is a solid value. Click here to get the whole scoop on Haswell. Buy now or wait and see? It's early in the Haswell lifecycle, but this machine offers a compelling combination of design and performance.